Oh boy, this one was a queue-hopper! 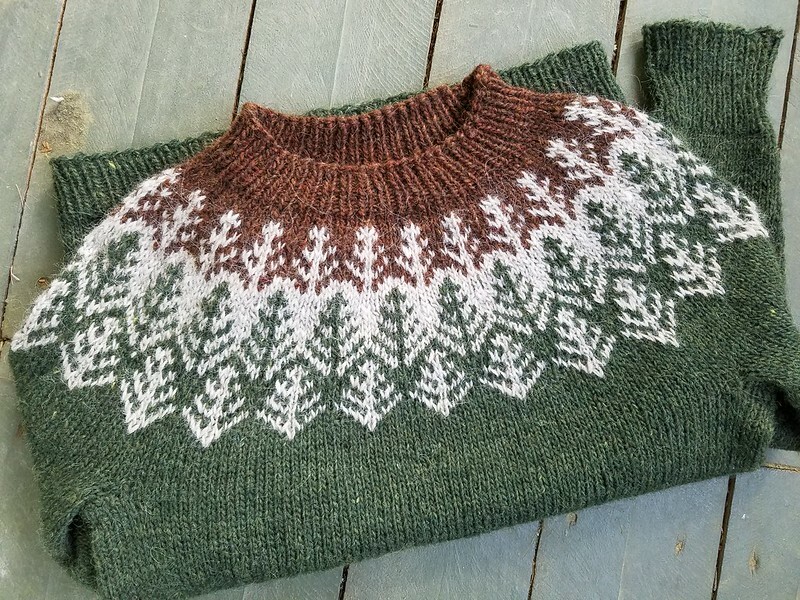 This pattern was released for Tolt Yarn and Wool‘s annual Icelandic Wool Month, and the second I saw it, I knew it would be next on my needles! I was busy finishing up my Bronwyn sweater during the month of March, so I was too late too join in on the Icelandic Wool Month fun, but I still appreciated the inspiration. 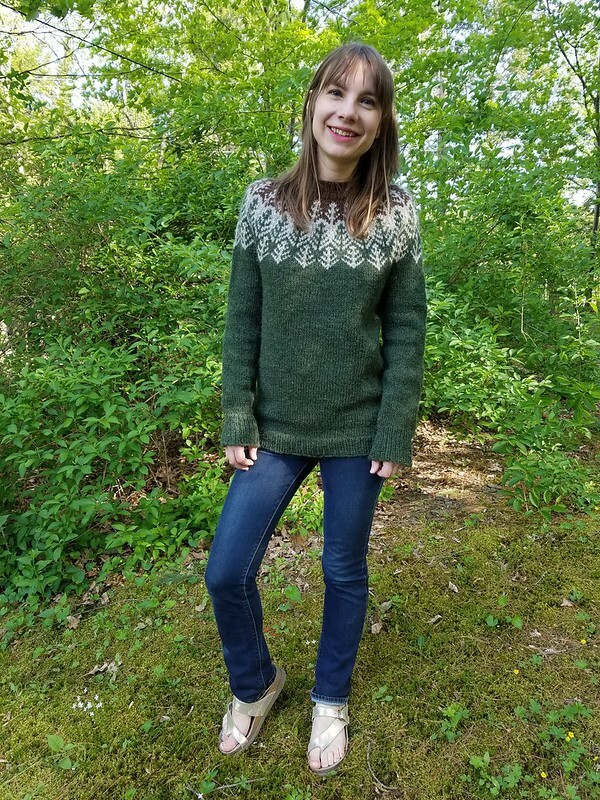 The pattern is Skógafjall (Ravelry page here) by Dianna Walla, a designer I’ve long admired (you can read her thoughts about the design here). It’s written for Ístex Léttlopi, which I’ve used before for a sweater and a handful of hats (the Moon Sprites pattern, also by Dianna, is a great one for gift giving, although Léttlopi may be a bit scratchy for non-wool-enthusiasts). I love the tree motif, and it was perfect timing because I’d just been thinking that I’d love to have a green sweater. 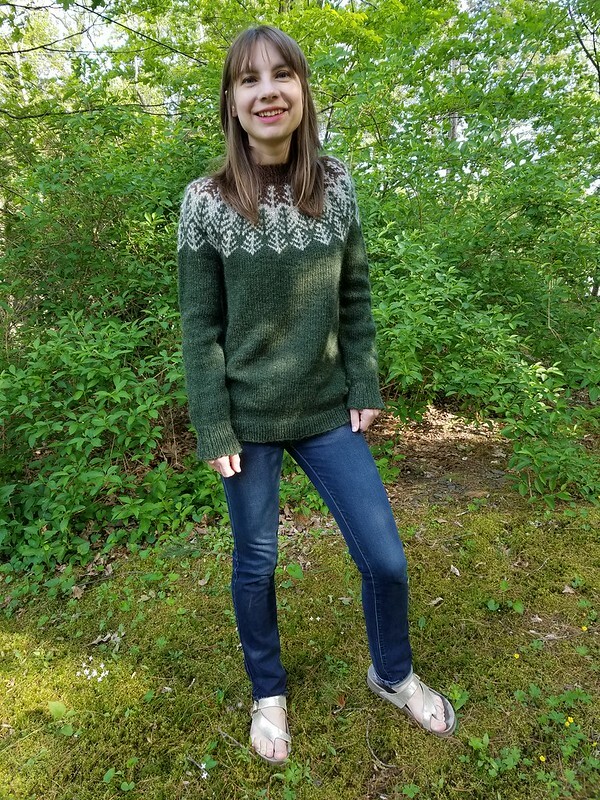 I used the colorway from the sample, pine heather, for the body, and I also used oatmeal heather (leftover from my first Léttlopi sweater) and hazel heather for the yoke. Léttlopi has many advantages, chief among them being its relatively low cost and its speed- aran weight knits up so quickly, especially in a seamless, stockinette sweater! I knit this in a month, mostly during weekend evenings. I can never seem to get recommended gauge in the yarn (4.5 stitches/inch, in this case), though, so I cast on for the size 35.5″, which gave me 37.5″-ish at my gauge for about 3″ of ease. This worked out as anticipated, yay! One of the nicest things about this pattern is the short rows for shaping. I’m not too familiar with them, so I linked to a few tutorials that I found helpful on my Ravelry project page. The effect of the short rows is to raise the back neckline, which prevents the sweater from riding up at the neck, something that I’ve noticed a bit with my previous lopipeysa. This sweater fits nicely and while it’s not too fitted, I’m not swamped in it and it doesn’t seem quite as unisex as my horse sweater. The only thing I’m not super happy with is my color scheme for the yoke. I’d intended to swap the background and accent colors for the yoke, but there wasn’t enough contrast between the green and the brown. This isn’t exactly what I had in mind, which is probably why it’s a good idea to swatch your colorwork before starting out. But even if I had, I probably would have cheaped out and just used the yarn I already had instead of ordering different colors, so I guess I would have had the same results! But overall, I’m happy with the sweater and I’ll definitely wear it lots this winter. It’s super drafty in my house, so I appreciate thick layers in the colder months! Alright, friends, what are you knitting these days? « Brooklyn Tweed Bronwyn Pullover! Thank you, Caroline! It’s such a nice pattern- I loved knitting it! Absolutely beautiful! You do such amazing work! Ahh, thank you, Susan! Smooch your pooches for me, please! Oooh, that scarf looks super plush! I hadn’t seen that pattern before, but it’s lovely. I hope you’re able to stay warm until you finish up the next few knits! The tree design is so fun! It’s a bit LOTR! Wait- you need to make a sweater with an elvish motto in the yoke or something! Bwahaha! Maybe not the Ring inscription. I take way too long to knit anything to have to toss it into Mt. Doom afterwards. I can’t believe how fast you knit this! It looks wonderful and cosy. I am working on my partner’s fisherman rib sweater which I started over a year ago around my projects but now I want to try and finish it. Well, I knitted this pretty fast, but my speed when I’m knitting for Blake is more like yours (takes me a year or so to finish, whoops!) Fisherman’s rib is slow going, I’ve heard- is that true? I love how it looks but I can’t quite get the hang of it. It’s such a simple motif but it’s really effective! I wish I could figure out how to design my own yokes, but alas, the math eludes me! Beautiful sweater, Sonya! I love that yoke design, both the colorwork itself and the shape/seamlessness. But is it comfortable to wear, both in terms of the sleeve/shoulder contouring (I’m used to seeing definite sleeve seams and/or rows and I don’t see that here) and the yarn itself? My boss went to Iceland for a holiday last year and brought me back 3 skeins of Lettlopi as a gift (I KNOW, RIGHT?!?!? So awesome. ); I would love to make a cowl with them! Happy knit-a-versary!! May there be many happy sweaters in your future! Let’s see, I find this sweater quite comfortable to wear in terms of fit. The fit is key for a round yoke sweater like this… if it’s too deep for you, the armscye then sits too low, which means that the whole sweater rides up when you raise your arms. I have this problem a bit when I wear my horse sweater, which was knit from a unisex pattern and is really too big for me. Otherwise I find it quite comfortable! As far as the yarn itself, it’s not like wearing merino or something like that. It’s definitely scratchier than that. I always wear a t-shirt, at least, under mine, so it’s not right next to more sensitive skin, although it doesn’t both me to wear it over short sleeves. Kinda depends on how you feel about wearing wool in general. 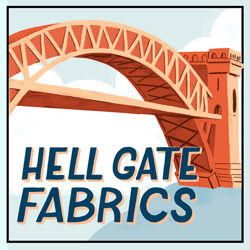 The benefit of the yarn is that it’s really hard-wearing, unlike some of the more baby soft yarns. I’ve worn my first Lettlopi sweater tons and it looks great and doesn’t have the pilling you sometimes see with really soft yarns. This is really nice on you! I love the fit for this weight of yarn, and can just imagine how cosy it will be come winter. Ooo! Your jumper is fantastic, and I think the colours are lovely together. This is beautiful, what a great job you did! It fits you perfectly! I’ve just learned the Entrelac technique, so I’m making a shawl right now but one day I’ll make a sweather too! You are a great inspiration! Oh wow this is gorgeous Sonja! I love the colours you’ve used and the fit looks great too. I just started relearning to knit this past winter and so far have only been practising moss stitch by making my son a scarf. I’m hoping to knit myself a hat in the autumn though! Sonja I’ve only just learnt to knit and am now fully appreciating the complexities of it so this project is blowing my mind!!! You are so talented! AHmazing!! You are so talented. LOVE love it.